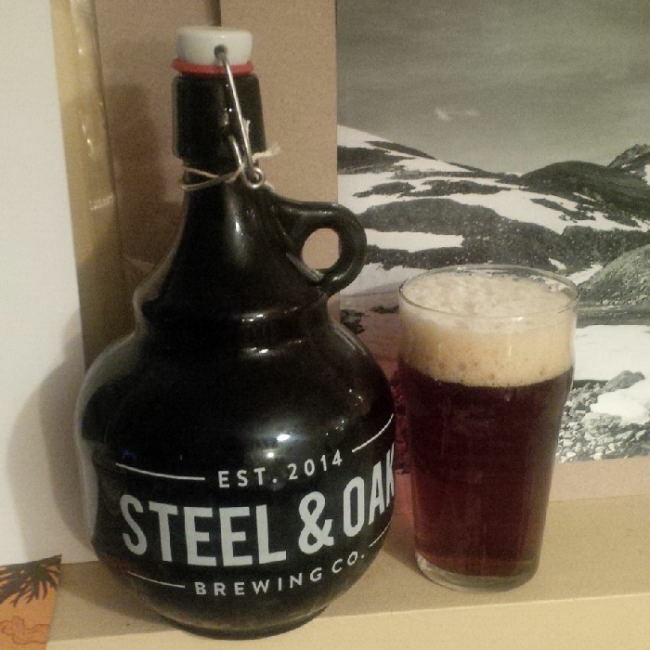 From New Westminster’s Steel & Oak Brewing comes their “Dark Lager”. The beer pours a deep amber or brown colour with a tan head. The aroma consists of bready and roasted malts, nutty but overall fairly mild. The flavour is of roasted and bready malts, chocolate, maybe a hint of burnt coffee and citrus with a fairly good dose of hops bitterness. The alcohol content come in at a standard 5% alcohol. When I reach for a lager it is almost never yellow. This is a great tasting full flavoured beer with just the right mix of everything you would want in a lager. This entry was posted in Lager and tagged bc, bitter, bready, bready malt, bready malts, burnt coffee, canada, dark lager, hint burnt coffee, hopped, hops, hops bitterness., hopy, lager, metro vancouver, mild citrus, new west, new westminster, roasted malt, roasted malts, steel & Oak Brewing, steel and oak brewing.